The 2Phone Case 4 dual SIM card adapter allows to simultaneously use one micro-SIM and one SIM card (standard format) in the iPhone 4 or iPhone 4S and to have two active numbers in the same time. Ideal for businesspeople, this dualSim card adapter allows to make and receive calls on both SIM cards simultaneously. The 2Phone Case 4 adapter incorporates its own GSM module (transmitter and receiver), a SIM card slot (standard) and a battery with a capacity of 800mAh. This additional battery directly supplies the GSM module, integrated into the case of the 2Phone, and can also be used to increase the autonomy of your iPhone 4 or iPhone 4S. If your iPhone 4/4S battery is running low, the adapter 2Phone takes over. Extremely thin and lightweight, with a thickness of 0.7cm, the 2Phone Case 4 adapter connects and is placed directly at the back of the iPhone 4 or iPhone 4S without altering the aesthetic look and feel. The Dual SIM cards adapter 2Phone Case 4 is very easy to install (see video installation), as it doesn't require cutting of your SIM cards or unlocking your iPhone 4/4S. Turn your iPhone 4 or iPhone 4S into a real dual SIM card phone with both cards active in simultaneous. Doubles the autonomy of your smartphone and increase talking time. 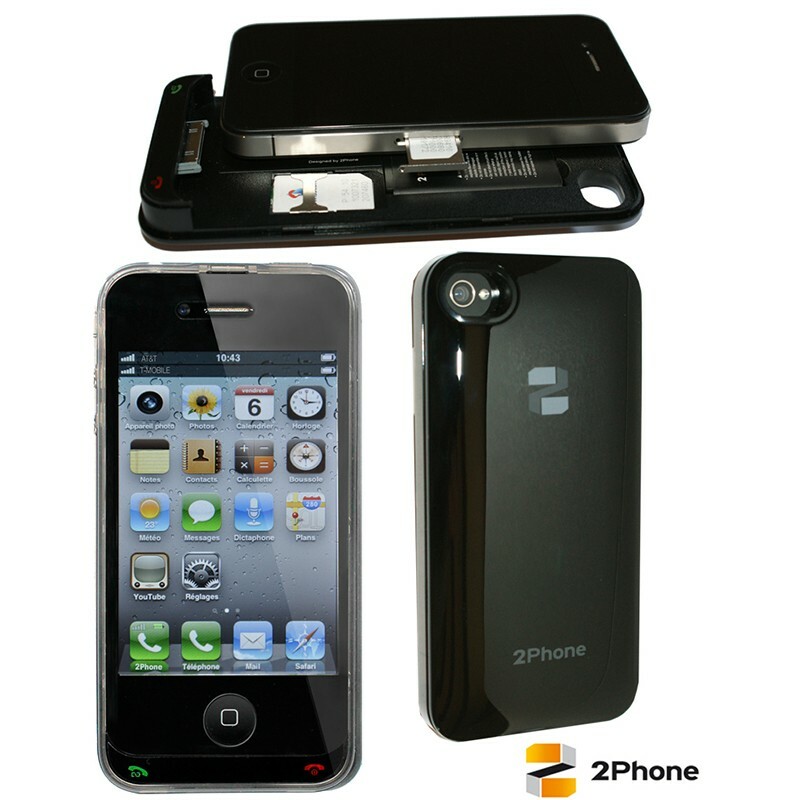 Protects your iPhone 4 or iPhone 4S from scratches and shocks, offering an additional protection. Shows on your iPhone4 or iPhone 4S screen the signal networks strength as well as the second battery level of charge.